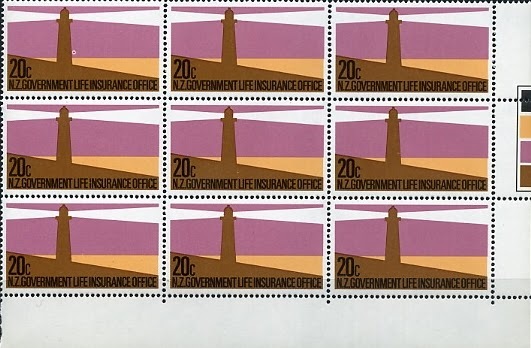 Virtual New Zealand Stamps: 1981 Government Life Insurance Office Lighthouses. 1981 Government Life Insurance Office Lighthouses. Back to 1969 Lighthouses. Government Life Insurance - Summary. Special stamps for use solely by the Government Life Insurance Office were first issued in 1891, a lighthouse being incorporated into each stamp design. Over the years other issues continued this theme with both symbolic and actual lighthouses being shown. The inclusion of a stylised lighthouse on the 1981 Government Life stamp issue continued this theme that had always appeared on Government Life stamps since their inception. This would prove to be the final stamps issued by the Government Life Office as their postage stamps were discontinued in 1987 when Government Life Insurance became Tower Corporation. 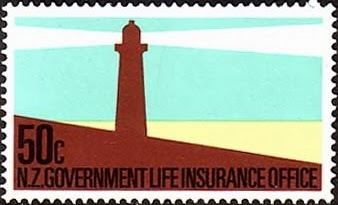 The symbol of a tower (lighthouse) was continued by the new company by their postage stamps were dropped. As can be seen below, Tower Corporation retained a large collection of stamps and other items related to Government Life Stamps. The final issue of lighthouses went back to a stylised design featuring bright colours and six values. I have noticed that with some these stamps the value and company name at the bottom have proved hard to read. 3c - Blue and Mauve Lighthouse. 10c - Purple and Red Lighthouse. 20c - Pink and Yellow Lighthouse. 30c - Mauve and Light Blue Lighthouse. 40c - Orange and Yellow Lighthouse. 50c - Turquoise Blue and Green Lighthouse. This corner block of nine stamps shows the result of a mark or dirt on the printing plate. It can be found in the left-hand stamp, where a small white ring touching the right side of the lighthouse tower is visible. 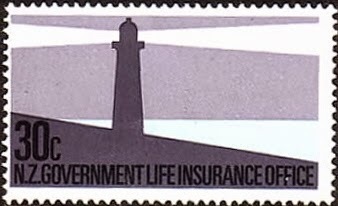 In other locations or on other stamp designs this might almost go unnoticed but the fact that it is touching the lighthouse adds to its interest value. 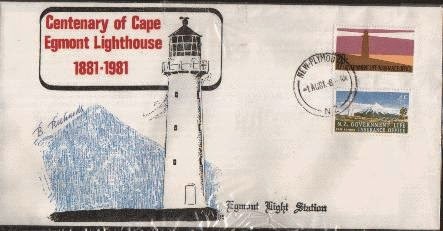 This cover, postmarked 2nd August 1981 marks the Centenary of the Cape Egmont Lighthouse. 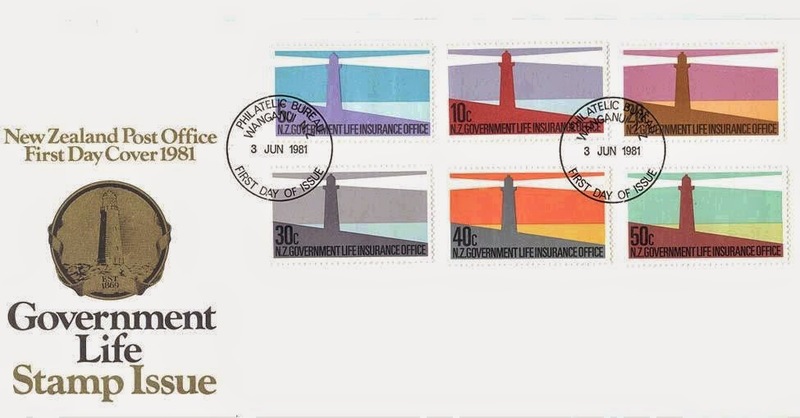 The two stamps, a 1981 20c stylised lighthouse, and a 1969 4c - Cape Egmont Lighthouse. This is not a postal item, its an invitation card designed to appear like a postcard. The event is a viewing of selected stamps from the valuable and historic Government Life Stamp Collection. The card includes a 1981 5c stamp which would have been discontinued by July 1992.